Winco TKPO-4 Offset Spatula with Black Polypropylene Handle 3-1/2" x -3/4"
TigerChef > Smallwares > Kitchen Utensils > Spatulas >< Icing Spatulas > Winco TKPO-4 Offset Spatula with Black Polypropylene Handle 3-1/2" x -3/4"
$1.72 Winco TOS-7 Spatula 7-3/4"
$1.46 Winco TNS-7 Mirrored Bakery Spatula 7-3/4"
$28.66 FDick 8133314 Straight Blade Spatula 5-1/2"
$22.23 FDick 8133413 Offset Blade Spatula 5"
$40.37 FDick 8133425 Offset Blade Spatula 10"
$2.19 TigerChef Stainless Steel Icing Spatula 14"
A must-have in any bakery, cafe, or restaurant, the Winco TKPO-4 Offset Spatula with Black Polypropylene Handle 3-1/2" x -3/4" is ideal for icing cakes and spreading toppings. 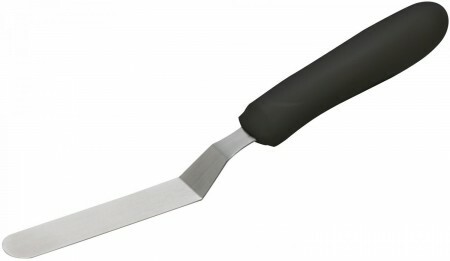 Equipped with a long, slender blade, this NSF listed spatula allows for precise edging on frosted desserts while its offset design easily follows the natural form of round and tiered cakes for even distribution of icing. Thanks to the satin-finished stainless steel construction of its rust-resistant blade, this high quality item provides unbeatable durability and longevity. For ease of use, this well-designed spatula has a black, ergonomic polypropylene handle for a comfortable, non-slip grip, reducing hand fatigue from extended use. Perfect for fast-paced commercial use, this offset spatula is dishwasher safe. Dimensions: 3 1/2" x 3//4"